The Colorado Buffaloes women’s basketball team adds to their ranks this Thursday, with signing of Sierra College’s Jaimie Curtis. University of Colorado junior Petra Hyncicova has swept the Nordic races in NCAA Skiing. Pac-12 Network's Yogi Roth has seen the film and he expects an exceptional game of strategy Saturday between the Buffs and Sun Devils. After leading 21-7 after one quarter, the Buffaloes will have plenty of positives to take away from their eventual 45-28 loss. The 2016 Rocky Mountain Showdown was a lopsided 44-7 win for CU. 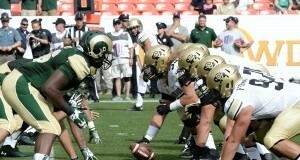 Following the game, Rich Kurtzman and Mat Smith of 5280 Sports Network recapped the action. Mike MacIntyre enters the 88th meeting between his Buffs and the CSU Rams with what he describes as the most talent he's had in his time in Boulder.